Hmm. 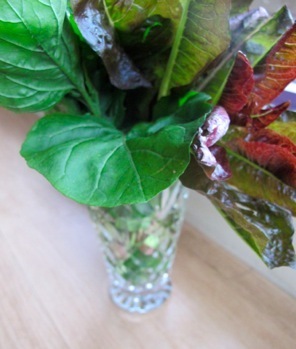 What do we think of greens in a crystal vase? I think I prefer roses, but greens are just about all my garden has on offer at this moment. 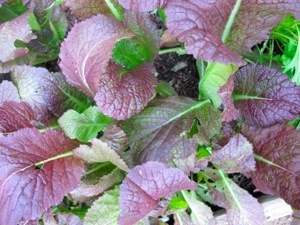 In Southern California, we have had lots of rain and the only thing flourishing in my yard are tasty chards, lettuces, mustards and arugula. 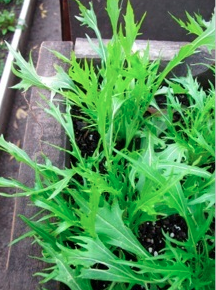 The Mizuna (below left) and the Red Mustard (below right) are bright and peppery. Three cups of these or any greens would be tasty as a bed for Caccio e Pepe-- the simple Roman pasta dish of noodles, cheese, oil and pepper (about the only ingredients “flourishing” in my pantry right now...) Perfect for the January budget! I like to serve this simple “cucina povera” pasta on a bed of tart greens. Boil pasta in large pot of rapidly boiling salted water until tender but still firm to bite. Meanwhile toss the greens, olive oil and garlic in large shallow serving bowl. Place 1 cup cheese in another large bowl. Drain pasta, reserving 1 cup pasta cooking liquid. Gradually whisk 1/2 cup pasta cooking liquid into cheese and continue whisking until mixture is emulsified. Add pasta and pepper and toss to coat, adding additional pasta cooking liquid if necessary to moisten. Spoon pasta atop arugula, sprinkle with a little additional cheese and serve.